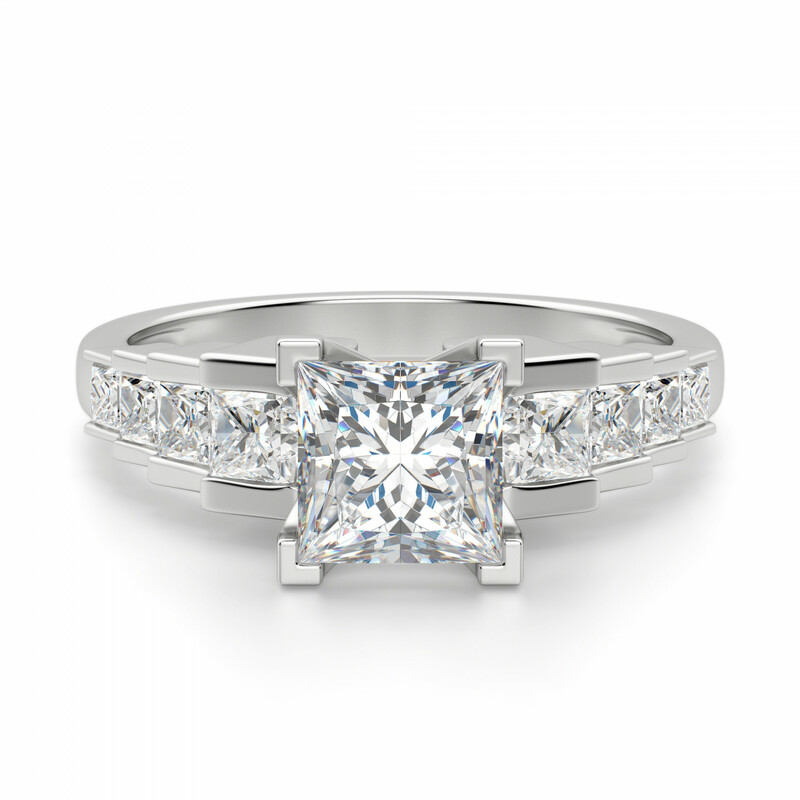 Cinderella Staircase Princess Cut Engagement Ring was added to your cart. This engagement ring is fit for a princess. The substantial staircase band glitters with eight accents flanking the Nexus Diamond alternative center stone, creating a modern look with more than a dash of romance. 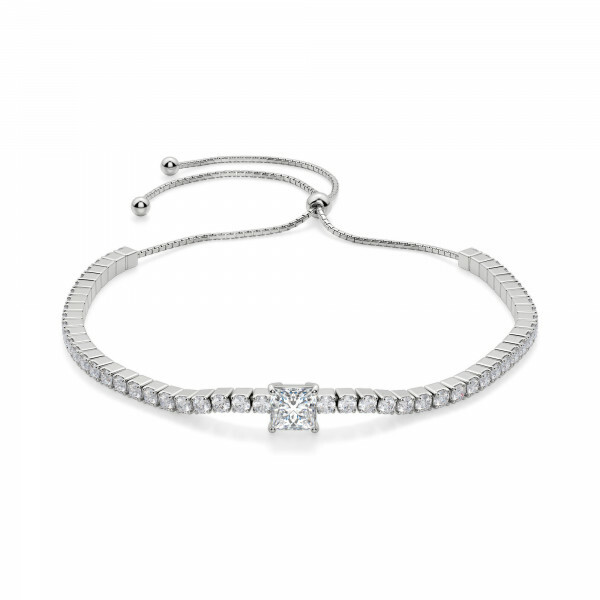 Complete the look with the matching Cinderella Staircase band. I have had this ring for almost 10 years now and it still sparkles beautifully. In the 10 years, I have sent it in only once for a spa day. I highly recommend it! Worst customer service ever. They are like talking to robots. Save yourself the trouble and buy real, good looking diamonds!! These turn to junk after a short period of time. ***Hello, I'm sorry you have had to replace your stone after 8 years. We do try to be as helpful and courteous as we can with all customer care related issues to help find the best resolution. As you mentioned, you can always upgrade to a 1215 Diamond, if you no longer want to continue your Diamond Nexus lifetime replacements." Love my ring. Upgrading the center stone after 7 years. Have the matching wedding band on each side. I get so many compliments on this set! A ring that's definitely fit for a Princess! First of all I want give a big shout out to Hannah! She is everything you want and more in a Sales Associate! Her kindness and patience is phenomenal, her ideas and suggestions were spot on!! I will be doing all my future orders through her. So thanks to Hannah I'm wearing a beautiful ring! I read all the reviews the good and the bad. I liked the way DN handled the bad ones and the fact that they published them. I make up my mind a lot on how the reviews are. Also I love the fact that this ring didnt cost someone their life not did it destroy our environment. I recieved the 1.24 carat center stone and it is an excellent size, I wear a 6.5 to a 6.75 with long fingers and this sits jut right! I recieve tons of compliments all the time. I also got the wedding band and added to the solitaire the combo is dynamic! I highly recommend to purchase it with the engagement ring! And if your looking for his ring the Cambridge is the perfect match! So don't spend anymore time reading all the reviews, I did that for you! Lol ! Go make your purchases! Oh and I was totally shocked at how beautifully they were packaged! Absolutely love the princess cut engagement ring I purchased. Just recieved it yesterday and the ring is absolutely beautiful. I chose the 1.75 carat size and it looks amazing. Can't thank you guys enough for all the way help you gave me. I proposed to my girlfriend with this ring and she absolutely LOVES this ring!!!!! She has gotten soooooo many compliments on her ring!!!! I've even gotten compliments for choosing a beautiful ring!!! Thank you Diamond Nexus for having wonderful selections for a wonderful occasion!!! My fiancé proposed with this beautiful ring!!! All I can say is , it is AMAZING!!! I have had this ring for almost a month now and I always get so many compliments on my ring!!! I love it so much I couldn’t be happier and I am so glad he chose this ring!! It’s perfect and so is he. I have purchased a ring from this site in the past. My girlfriend loves the ring. I have only had this ring for a couple of weeks. I got the 2 CTS and I sits up a lot more than pictured. The setting is a little off, meaning not straight with the band. I were it all the time and my hands are constantly in water. It seems to be holding up so far. If you have to put on rubber ber gloves a lot, it can be a little difficult because of how tall the diamond is. Because it is 2 CTS and its flawlessness it does look a little fake, but I dont care it sparkles. So far pretty happy with my decision. This ring is absolutely stunning. I get so many compliments on how beautiful it is. I can't wait to get the matching band!!! I love the jewelry that is provided & my Cinderella Staircase Ring is the most beautiful ring ever!! Y'all did an amazing job on creating this beautiful & elegant ring. I've had this ring for 5 years and it is still so beautiful. And holding up great. Sent it in for the first time about 6 months ago for a cleaning and rhodium plating and it came back looking brand new. A couple years ago I lost it for over 6 months it sat in my yard through fall and winter. My mom found it outside and after running some soap and water on it it looked brand new! The stones have never faded clouded or scratched. And the band has held up great it is 14k white gold. The bands are a nice thickness and good quality too. It only started to yellow a bit where my engagement ring and wedding band were rubbing and that was only about a year ago. And customer service is very helpful. My mom was so impressed by what this ring had went through setting outside she got a ring from here and she loves hers too. Don't hesitate buy from these guys you won't be disappointed. Total Hit, very beautiful and gorgeous ring! I ordered this ring for my wife for Christmas and she's still smiling and showing it off to everyone! Smack down gorgeous! I'm truly in love! My dream has finally come true! You see, I instantly fell in love with Cinderella Staircase the very first time I viewed it quite some time ago. And yes, I really did dream about it. And now it is on my finger even as we speak, and I couldn't be happier. I specifically wanted it cast in palladium, as I have many rings set in white, yellow and rose gold. Thank you Diamond Nexus, a thousand times over. My fiancé proposed to me with this ring! It is absolutely beautiful. Everyone that see's my ring compliments me on it. We got the certified stone with it. I am in love with my ring and matching band. I am writing this 6 years after my, now, husband purchased the ring. I am still in love with this ring, everything about is perfect. I have alway gotten tons of compliments and I've been told it look huge which always make me smile. My husband made a great choice with this unique ring. Also, the durability of the ring is great. We are barely sending it to get repolished with the life time warranty, which is awesome! Totally, recommend this ring! My boyfriend gifted this to me for our two year anniversary and I am in love with this ring. I do wish that my carat size was a little bigger but it was completely my idea to not get it so big just so that it doesn't look fake. But my god, this ring is beautiful and I'm always getting so many compliments on it!!!! I love this wedding set...it is beautiful!!! My fiance loves the ring. All her friends think I spent much more than I did. Will definitely be purchasing more jewelry from Diamond Nexus. This is the 2nd ring I get thru diamond nexus. The ring is so beautiful and totally looks like a mined diamond. We couldn't be happier with my ring. Thank for the prompt delivery and service. The product is gorgeous. They do not skimp on quality. They sell exactly what they say they will. I love the clarity, cut and how the item was packaged. Ring is Beautiful but Shipper wastes your time. The Ring is stunning and the Wife started to cry when she got it. My husband presented to me this beautiful engagement ring & matching band for our 15th wedding anniversary! It was a total surprise when I received it as he has never purchased me jewelry before. To know that he actually took the time to do his homework on the company as well as take into mind all the rings I had "circled" in the catalog. He made the perfect choice as this one was my favorite by far, out of all that I had envisioned on my hand. He went with the 2.01 ct and it shines from all angles & is completely amazing. I receive compliments all the time about just how beautiful it is. First off let me say that the diamonds are a great fake when you look down on them. They look very close and have even more sparkle then a real diamond. To a lay person it will look authentic. The issue is when you look at the diamond from the side. The top and bottom are clear glass, and in the middle its where some gem like refractory piece is inlaid. So from the top looking down it sparkles like a real diamond, from the side its clear that its not. The diamond is not actually cut, its just clear, and the internal piece is deigned to reflect light like a cut diamond. Its very interesting and I'm hoping it will fool my girlfriend, but anyone who examines it in detail can see right away something is not right. In love with my ring! I love, love, love my ring! My fiancé did such a great job with choosing, something I didn't tell him about. I like my jewelry to be different than what everyone has, and that is what he did. I like to have what I buy to look expensive, but without the expensive price tag. I can't stop looking at my ring! THE RING: we chose14k yellow gold with the 1.24 carat center stone. The pictures on the website just didn't do it justice! In person, This ring truly dances in the light and, as a result, catches the attention of envious random strangers everywhere. Hands down THE best deal out there for the money. I was a little surprised that the center stone sits in white gold prongs when, as requested, the rest of the ring is in Yellow Gold but it seems to add some character and uniqueness mixing up the colors, I suppose. DIAMOND NEXUS: delivered when promised and brought their "a-game" in terms of packaging the ring in such a way that it added a lot of dramatic effect to help my man with the "presentation". Thank you!! You have a new repeating loyal customer in me!! I bought this ring for my fiance and let me tell you that this was a VERY good investment. Every where we go people stare at her ring and comment on how BIG it is lol. I'm getting the matching wedding band to complete this set. MAY 26th couldn't be sooner!!! I loved my ring and have gotten many compliments on it. I have had it for 1 yr. Our wedding is in June and I am afraid to get the matching wedding band. I ordered the 14k white gold and it is yellowing. This should NOT be an issue!! Hi, you posted this review as a guest, so we can't reach out to you directly to help. Just so you know, all white gold from any jeweler is actually not "white" it's a pale yellow color. White gold is regular yellow gold that is mixed with other alloys to lighten it. It is then coated with a metal called "Rhodium" which is actually a member of the platinum family of metals. 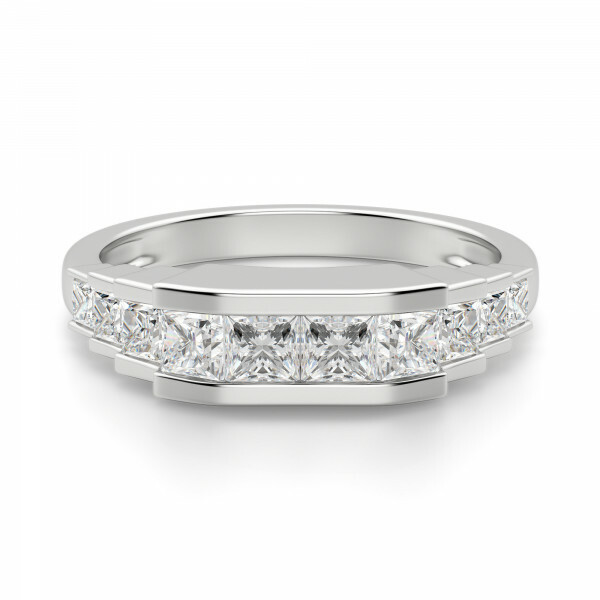 Rhodium gives white gold the very bright, chrome-like finish we all like. Under normal wear, this rhodium finish wears off and the pale gold color of the "white gold" starts to peek though. The time it takes for this to happen can be from one to five years depending on how you wear your ring, and even more importantly, your body chemistry. 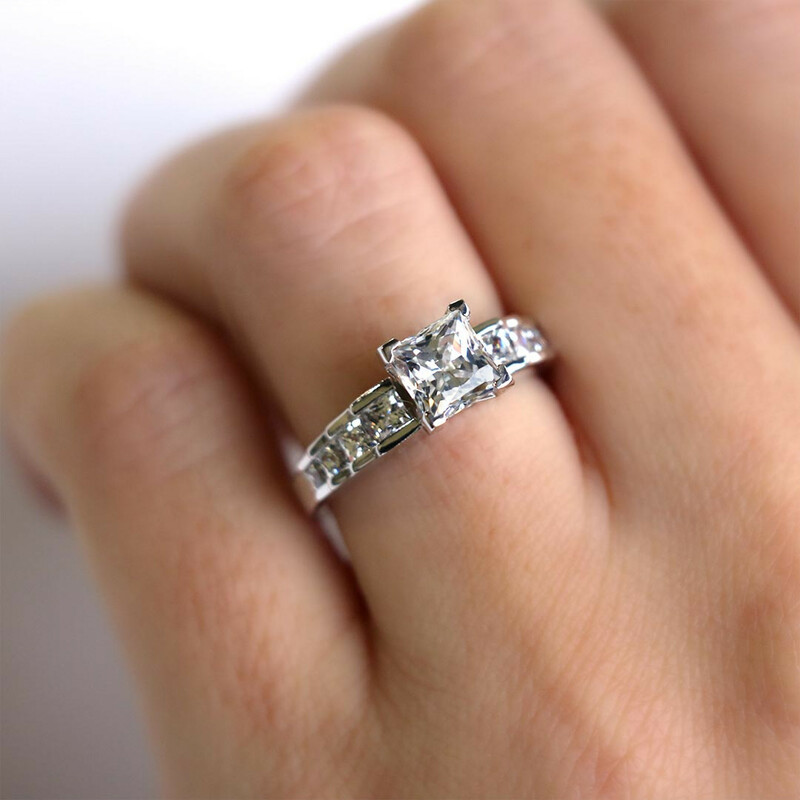 The average time that we recommend to have your white gold ring cleaned and "re-rhodiumed" is two years. If you see this message, please call our Customer Care line and we can help you with this. Also, if you have a particularly high PH skin chemistry, we can compensate for that by doing a palladium coating under the rhodium. That will help. I am constantly getting complements every where I go. They say I am so lucky and surprised my husband picked it out by himself. I have the 1.5 center and it is big enough. I feel anything bigger would look fake. Ive had it for 2 years and I recommend getting it cleaned every 6 months to keep band shiney and diamonds shiney. When my husband surprised me with this ring I was blown away that he could pick out such a beautiful ring. I adore it and he is just perfect for doing such a great job. 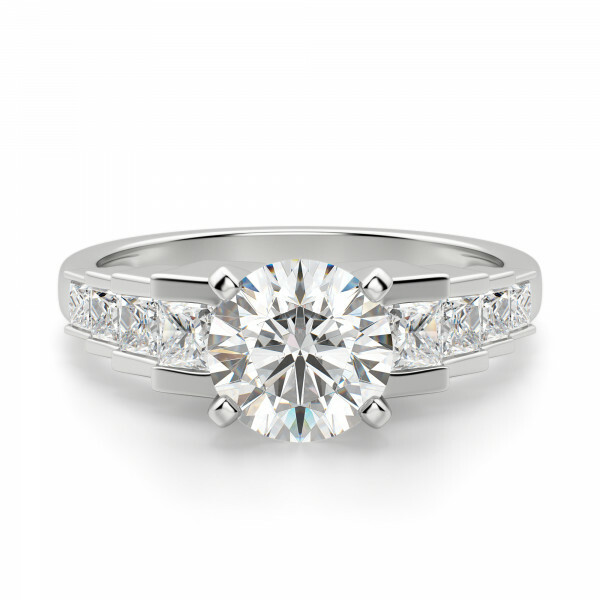 This ring truly does glimmer in every kind of light. Another review said that she gets a lot of compliments and I can vouch for that because I too get a handful of them. I got the center diamond that was about 2c so its a bit smaller but it looks huge! I wouldn't want it any bigger. I absolutely adore this ring. I have received so many compliments on it that I can't even count. If you're considering getting this ring, just do it! It's beautiful and you and she will love it! I got my ring earlier this year.it sparkled like crazy!!! I loved it! I still enjoy receiving complements on my ring. I have one issue, my ring is beginning to lose its sparkle. Is there anything that I should avoid, or beging doing do that I can get the shine to really SHINE like it did before? Overall fabulous ring. I love the price and quality. Thanks DN! Diamond Nexus Responds: We are so happy to hear how much you love your Cinderella Staircase. 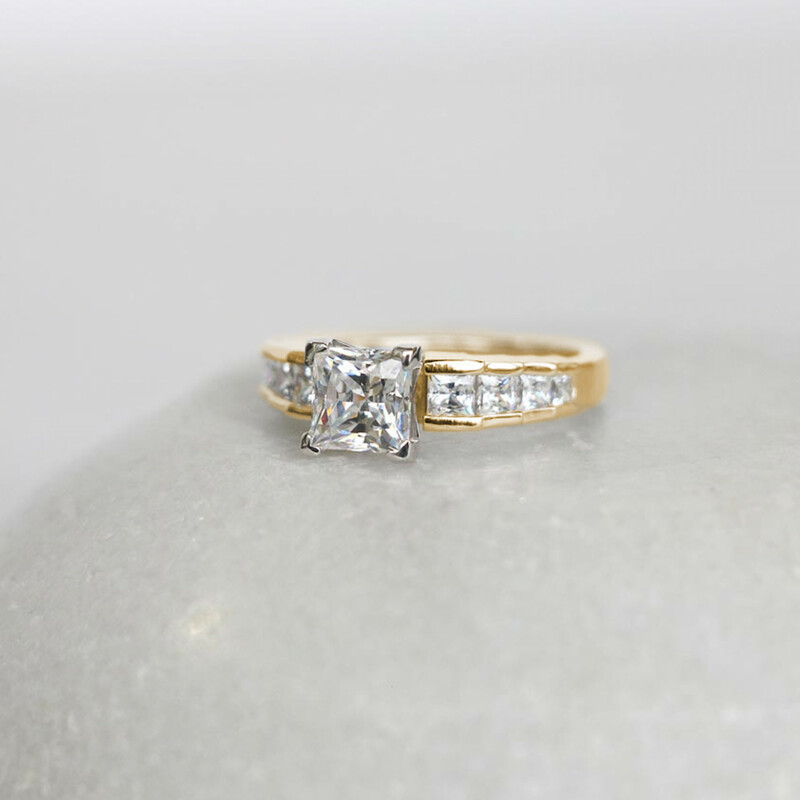 We would suggest letting the ring soak for a good 20 minutes in jewelry cleaner. This will help the debris that's caught under the center stone loosen up, and you can then brush it with a very soft toothbrush. Things like lotion, perfume, and certain soaps can build up film on the stone over time. My fiancé proposed to me with this ring and I was absolutly amazed!! I love it! I love everything about it. I get compliments on it everyday. The quality of the gold is beautiful and very sturdy. The ring is put together very well. Everyone thinks he spent a ton of money on it! Now we are using all the money we saved on the ring towards are honeymoon! Thank you dnl for creating such a wonderful life lasting product! We won't go into our marriage in debt. My boyfriend proposed to me with this ring the other night and I can honestly say this is the most beautiful ring I've ever seen. The video and pictures do this ring no justice! The way it sparkles in the light and the clarity of the diamonds is just breath taking. My fiance sure knows how to make me feel like a princess and he did it again by purchasing this ring. I absolutely cannot wait for him to get the matching wedding band..this is the type of ring I have been dreaming about having since I was a little girl and Diamond Nexus helped my fiance make my dreams of the perfect ring come true. Thank you!!! I got my ring recently and was very surprised- it was beautiful and caught the light each way it turned- I definitely would reccomend this place to others. This ring really sparkles in the sunlight! 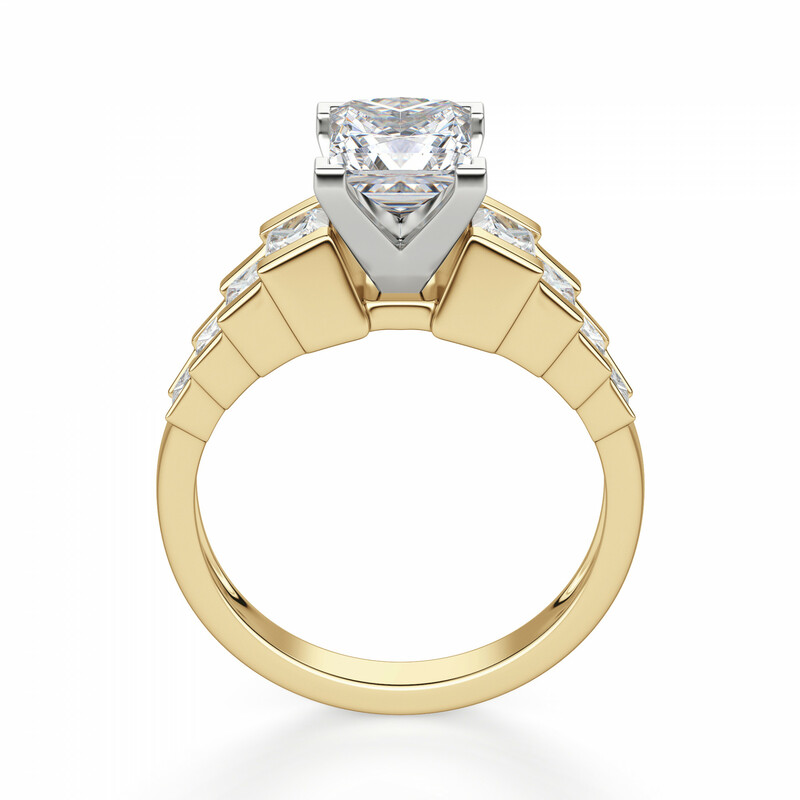 I could hardly wait for my engagement ring to arrive. When it did, and I placed it on my finger, I was not disappointed. I took it out to look at it in the sunlight, and OMG, it looked even more gorgeous! I can't wait to wear the matching wedding band! I received this ring and it was beautiful, but ,the setting is very sharp and I have cut myself twice on it, and also you have to clean it all the time or it looks like a cheap piece of glass, not a good cut . I don't wear it any more and i am sorry i spent so much money on it should have got a round cut ring. I have had my Cinderella Staircase ring and Matching band for 8 months and my band on the Cinderella Engagement Ring ( not the Wedding Band) is starting to turn Yellow. I bought the White Gold. When I called they said I could send it back and they would re plate it for me with the expense TO ME. I am not happy at all with this procedure and will not buy anything else from Diamond Nexus. P.S. I have only cleaned it with Amonia and water like the instructions said and do not wear it when i am doing household chores. Diamond Nexus Replies: Hello, I want to personally apologize you are having issues with your metal work. Every few years, White Gold can have the tendency to change color due to its chemical nature. This can be caused to exposure to chemicals (cleaning chemicals or lotions), heavy lifting or yard work. We are very sorry for your inconvenience and want to right the situation. I encourage you to reach out to our Customer Service with your order number via live chat or phone at 80.509.4990. I truly hope this gets resolved soon! I have been married over a year and a half & my ring is just as stunning as the day my husband proposed. Picture doesn't do it justice. Fast delivery, and exactly as described. Can't stop starring at it. Sparkles just like real diamonds and can't tell the difference from my real diamond rings. This ring is just amazing! My wfie-to-be gets so many compliments on the ring. When we first looked at the rings, I actually had to convince her that if she were to ever get a ring that she'd like the 1.24ct center stone over the .71. DNL customer service was great-handling my nervous calls to make sure the ring would be here by Christmas Eve! I got here just when they said it would and I was very pleased when I opened the box! The best part is-she said "yes!" and loves her ring! I was given this ring as an engagement ring in April of 2010, and it still sparkles and looks just as beautiful as the day I got it! In October of 2010 we were married and I bought the matching band, and they look amazing together! My only issue is that they are starting to look gold instead of the white gold they are suppose to be. I was told that they need to be rhodium plated and that I could send them in and that this would cost me a fee. I haven't done that yet because I love them so much that I hate to send them in the mail, I will be a nervous wreck until I get them back! Plus I hate to see them off my finger! All in all it is a great ring, so much so that my brother's have come here to get their future wives gifts as well! My husband for Xmas presented me with this ring and I love it! I had a couple of shipping issues with Diamond Nexus; however customer service has since resolved it. I have to send it back again because the wrong size was sent, but customer service is allowing me to get one diamond size up. I do agree with one previous comment and that the band is really thin. Otherwise, customer service is great and the ring looks great!!! This ring was love at 1st site!! My fiancee picked it out and showed me before buying it and I was absolutly floored when he picked this stunning jaw dropping ring!! It just glimmers!! And not to mention the amazing customer service we reveived from DNL, This was just the 1st purchase of many!! We're lifers!! Diamond Nexus responds: Thank you for checking out the lovely Cinderella Staircase ring. 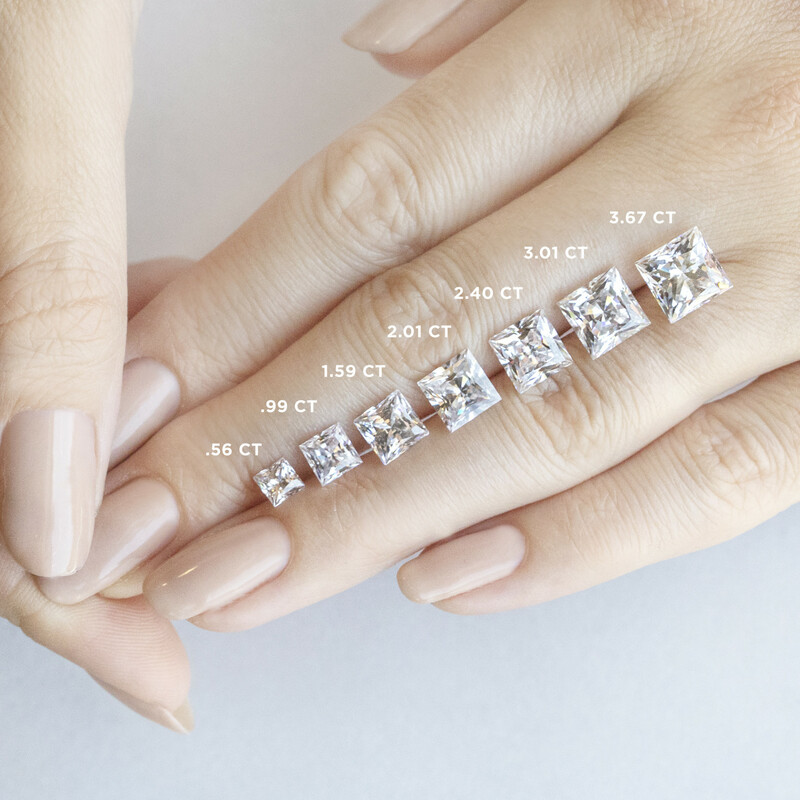 Comparing the finger shape and ring size are both important things to look at when determining the size you need for your ring. Staying with a stone under 2 cts. will be most comfortable for most women, but other factors such as what you do for a living and if you already wore larger jewelry come into play as well. Our suggestion to you is to choose the smaller of the two and see how you like it. We offer a 30 day money back guarantee as well as exchange to a different size so you can easily exchange the size for larger or smaller if you would prefer. Feel free to email us at customerservice@diamondnexus.com with any further questions. The ring is beautiful. My complaint is the band is very thin. With the beauty of the stones I expected this band to be thick. This is the ring that completed it all! My fiance is so totally pleased with this ring! I have to admit that I was some what skeptical with ordering a ring that cost so much online, but in the end to see my fiance's face light up when I showed it to her for the very first time, and placed it on her finger,...well that my friends is (priceless)!!! Thanks Diamond Nexus!!! Diamond Nexus responds: We are thrilled to hear about your positive experience and are so appreciative that you choose Diamond Nexus as your jeweler. The look on her face is one we know you will never forget. Congratulations to you both! This ring setting & has very sharp edges and must be cleaned all the time . If not it looks like a piece of glass. Don't buy this cut. Not a good choice. My friend bought the round cut and it looks so much better than mine I never wear this ring. Today I recieved the Princess cut 2.01ct center. Be aware that this rings band is incredibly thin!!! It looks kind of thick in the photos/video- but it is small. The ring is beautiful- my fiancee did a great job. I HAD a 1/2ct princess on my finger from Kays, and this ring BLOWS it out of the water. The color and clearity is much better than my jewelry store bought ring.. This ring does look HUGE on my finger- my size is 5.75. Of course it is going to look big compared to my 1/2ct. All in all it is pretty, I am a little worried that since it is SO much bigger than my 1/2ct that people may thinkg it is gaudy and fake. But it is beautiful and I love it! I've had this ring for about 3 years and I get so many compliments on it, even multiple times from the same people! Just simple, classy and elegant! Thanks Diamond Nexus for making me one happy lady! My fiance popped the question with this ring a month ago. It's just like one we saw at a downtown jewelry store which was WAY out of our price range. This one is even more beautiful. The radience and sparkle is lovely, especially in the sunlight. I can't stop looking at it. I have to say this ring is beautiful. I didnt know what to expect when i first ordered the ring. I must say, from the moment I opened the box i was amazed. I cant wait to see her face once I give her this ring. Im sure its going to be priceless. Great job DN. Im surely coming back to get the matching band. You have a customer for life..
My hubby got me the ring and matching band for my birthday/anniversary present. I can't even explain how beautiful it is! When I got in the car to drive I couldn't stop watching it sparkle. It is so much prettier in person, beyond what I could have hoped for!! My Fiance bought me Cinderella's Staircase, as well as the wedding band that goes with it. This ring is so beautiful!! I have never had anything like it. Everyone thinks that he paid thousands of dollars for my engagement ring. I have a total of about 4 carats. Its the most amazing ring! You can't go wrong with this ring!! This ring is absolutely stunning. I got the 2.4ct center stone, and when we picked it out it was my absolute favorite of all the engagement rings. However, once I received it, it just wasn’t what I expected. Let me be clear, it was not a problem with DNL, the ring was exactly as it should have been. When my fiancée put it on my finger it just wasn’t what I pictured wearing for the rest of my life. I wore this ring for about a year before I exchange it for a different one. My fiance got me this ring on Valentine's Day this year and it's sooo unbelievable beautiful!! You should see how it sparkles! The worksmanship is amazing! We decided to go with the 1.28 ct cushion cut center stone. I love the fact that we were able to customize it to what I wanted and he loved being able to get me the ring of my dreams at a affordable price. Everybody at the store were helpful and were able to answer every question and concern. Thank you Diamond Nexus for everything you have done! It has made our engagement extra special and stress free! I bought this ring for my wife and she was so amazed. She gets compliments all time from family, friends, and strangers. It has a very nice shine to it and people notice it when's she's out shopping or we eating at a restaurant. I loved it from the moment I found it here. Thanks DN. I received this as a Christmas present and so I have been wearing it for about three months. 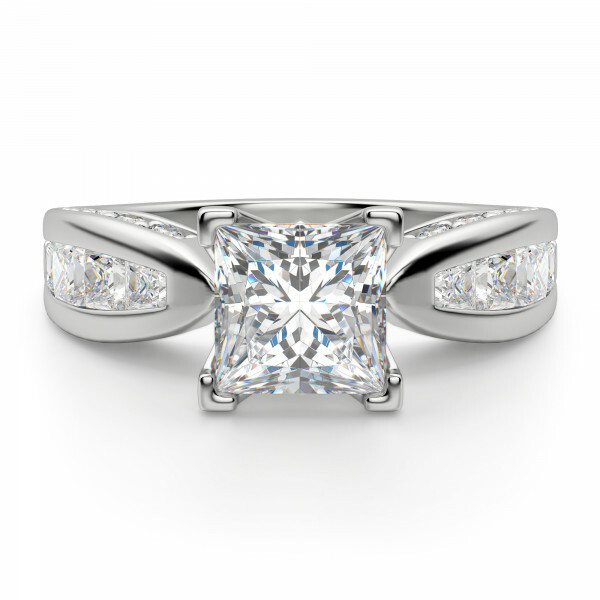 I have the 2.01ct Princess cut center. It's amazing. 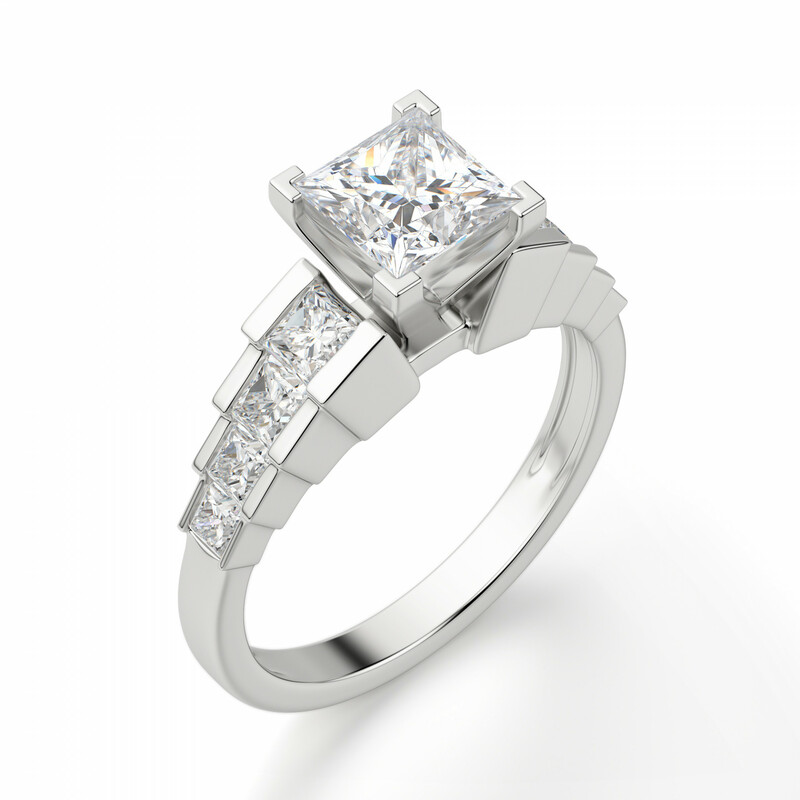 I have a smaller 1/2 carat Princess cut natural diamond and there is no comparison. The Diamond Nexus is much prettier. Perfect refraction and tons of fire! Even my jeweler, who I could see was none too happy, said it was a pretty amazing stone. I saw another reviewer said it looked "glassy" and all I can imagine is that she has never seen a perfect "D" color diamond before. It looks exactly the same. My now husband bought me this ring and the matching band for our wedding. I love this set and it is beautiful. I have had the ring for almost 2 years and it looks just as good as when he bought it. Out of all of my friend's rings, mine shines and looks the best. Definitely a great buy!! Gorgeous ring, Excellant quality, she loves it! I bought my fiance the Tristan engagement ring. The Cinderella Staircase ring is the closest match to that one. The staff at nexus assisted me with all the details. Not only did I get this ring engraved for my future wife, the helped me to change the stones to exactly match the Tristan. They took the trouble to look up my previous order and be absolutely sure everything was perfect for me. As for the customer who complains that the white gold yellows, I too ordered white gold and we have noticed no such problem with our ring. Also, Nexus stands behind what they sell. All you need do is call customer service and they will do everything in their power to make it right. Read your guarantee/warranty. It also states fully what to do if there is a problem. Nexus went above and beyond with service for us. I woud not hesitate to order from them again.